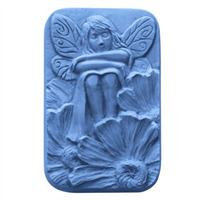 Our serene Fairy soap mold features a watchful, winged sprite among the flowering cosmos. 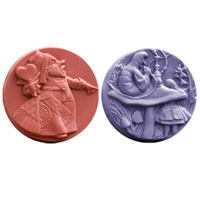 As part of our Wonderland series of soap molds based on the Lewis Carroll classic with illustrations by John Tenniel, our Wonderland 2 soap mold features the White Rabbit as the Red Queen’s herald, and Alice trying to play croquet with a flamingo. 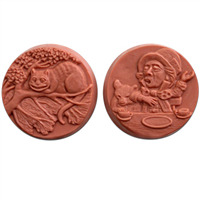 As part of our Wonderland series of soap molds based on the Lewis Carroll classic with illustrations by John Tenniel, our Wonderland 3 soap mold features the Queen of Hearts, and a caterpillar smoking tobacco with a Turkish hookah. 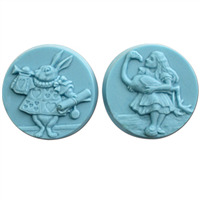 Bar Depth: 1.12" Bar Length: 3"
As part of our Wonderland series of soap molds based on the Lewis Carroll classic with illustrations by John Tenniel, our Wonderland soap mold features the Cheshire Cat and the Mad Hatter.